Editor's note: This story was updated on Nov. 30 with additional information about U.S. Rep. Michael McCaul drawing the Republican Steering Committee's recommendation to become ranking member of the the U.S. House Foreign Affairs Committee. 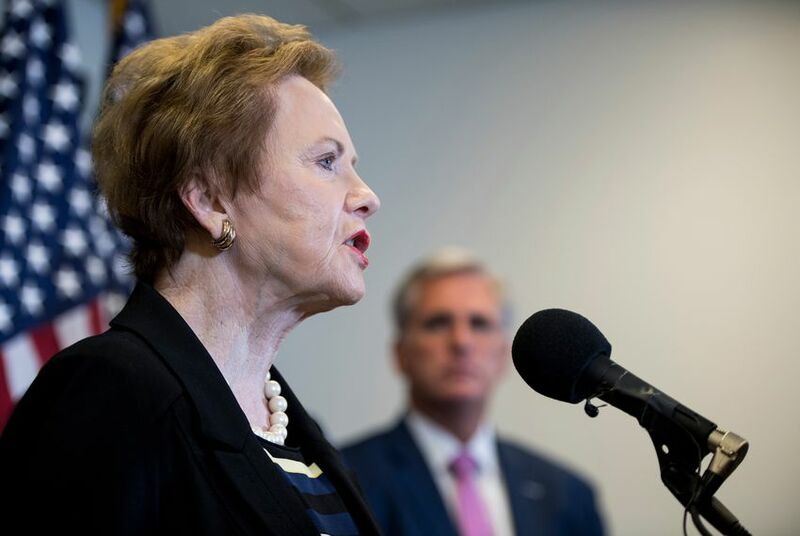 WASHINGTON - An influential group of U.S. House Republicans recommended U.S. Rep. Kay Granger of Fort Worth as the party's next top member of the powerful House Appropriations Committee. The group, the Republican Steering Committee, is a leadership-aligned council of members who issue recommendations for top committee posts. This guidance is rarely ever overruled in a larger conference vote, but the appropriations fight was contentious. Granger's appointment will put her in a rarefied league as one of the few Republican women to ever reach such a high position in any of the House's major committees. The appropriations committee is tasked with deciding how the government spends its money. It is one of the two most powerful committees in the House, along with the Ways and Means panel, which is currently chaired by U.S. Rep. Kevin Brady, R-The Woodlands. Brady and John Carter of Round Rock both serve on the GOP steering committee and were strong Granger backers. Granger's primary rival for the post was U.S. Rep. Tom Graves, R-Georgia, a much more junior member of the Appropriations Committee. Members and staffers began to sense the steering committee's members were leaning in his favor in recent days, prompting a sense of unease among some House Republicans. At issue was both the optics and the political significance of passing over Granger — particularly given her seniority and the chance the party's leadership had of installing one of the few Republican women in Congress in such a powerful position. The committee's decision to back Granger Thursday averted two problems: House Republican women had become increasingly outraged with their lack of representation in senior posts within the party this fall, according to numerous Capitol Hill sources. Additionally, Texas donors are a major source of GOP money and their displeasure with party leaders passing over Granger could have inspired fewer donations. Texas delegation members worked furiously on Granger's behalf to help her secure the appropriations slot. As the largest state delegation in the conference, Texas Republicans take great care to work as a unit and throw their weight in order to secure committee leadership posts. Texas Republicans are poised to lose all seven of their current committee chairmanships once Democrats take control of the chamber in January. Two of those chairs, U.S. Reps. Jeb Hensarling of Dallas and Lamar Smith of San Antonio, were already retiring. Additionally, Rules Committee Chairman Pete Sessions of Dallas lost re-election in November. Brady was one of Granger's biggest advocates in the process. Carter, a fellow appropriations member, agreed. The debate this time around is a morose one for Republicans. Instead of doling out committee chairmanships, the group is recommending members to the minority counterpart role, ranking member. But in an ironic twist, Granger could arguably have more power within the Appropriations Committee as the ranking member than she would have had as its chair because some House Democrats have suggested restoring earmarks to the spending process, a mechanism Republicans eliminated in 2011. Earmarks are a means for House members to specify their preferences for federal spending in their districts. Much of that earmark power — when it is available — is concentrated within the Appropriations Committee. Granger’s likely ascension makes for an interesting pairing at the top of the committee. She has a close friendship with the incoming Democratic chairwoman, U.S. Rep. Nita Lowey of New York. Two key arguments Texans made to colleagues in support of Granger is that she has seniority and has been a leader on a number of thankless projects. But most emphatically, they pointed out that the GOP is reeling over the loss of about a dozen female members and in dire need of female representation. Granger was the first female mayor of Fort Worth in the early 1990s. When the local congressional seat opened up in the 1996 cycle, both parties fought hard to recruit her. Ultimately, she went with the GOP and won. She's gained a reputation throughout the U.S. Capitol as a steely but effective player. More recently, she's been on the receiving end of a rash of negative coverage from her hometown press over her efforts related to a massive and controversial economic development and flood control project known as Panther Island. Before the steering committee voted Thursday, it heard presentations from the candidates. Granger emerged from her presentation ebullient. "I couldn't feel better," she said. Carter excused himself from the room to praise the presentation and hug her. "It was unbelievable," he said. "She was great." When asked how long she had prepared for this moment, Granger answered, "All my life." In a far less contentious race, U.S. Rep. Michael McCaul secured the steering committee's recommendation for the ranking member slot for the U.S. House Foreign Affairs Committee. U.S. Rep. Eliot Engel, a New York Democrat, is poised to be the committee's next chairman. McCaul is winding down his tenure as the chairman of the U.S. House Homeland Security Committee. The power shift of committee chairmanships will take place on Jan. 3, the first day of the 116th Congress. A lone Texas Democrat is expected to become a committee chair next year: U.S. Rep. Eddie Bernice Johnson of Dallas is on track to take the gavel at the Space, Science and Technology Committee.